The 20th Century Theater has long been the icon for Oakley. 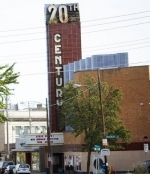 Originally a movie theater, it was built in 1941 and was the first air conditioned theater in Cincinnati and the first to offer free valet parking. It was designed for improved acoustics, something not often considered in movie theater design at that time. The theater fell victim to the proliferation of multi-plex theaters and closed in 1983. It fell into disrepair, but was restored as a retail flooring operation, and then became a church for several years. Eventually, in 1997, it became the 20th Century as it exists today, a venue for special concert events and private functions. It hosts both local and national talent on a weekly basis, and is a popular choice for wedding receptions. As one of Cincinnati's oldest neighborhoods, Oakley is a unique mix of the old and the new. Sometimes overshadowed by its trendy neighbor, Hyde Park, Oakley's eclectic residents know they've got a great thing going in a neighborhood that definitely holds its own. A trip to this intriguing corner of Cincinnati offers a blend of community pride and a sense of wry humor, whimsy, and a twist of sophistication. It is a neighborhood of front porches, of gas lights and sugar maples. It also has the lowest average home prices of the three-neighborhood region that also includes Hyde Park and Mt. Lookout.